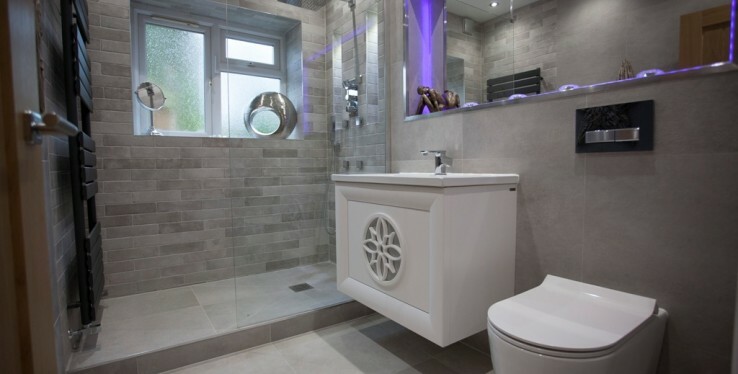 Real Stone & Tile supplied bathroom ware and tiles for a beautiful home in Sandbach, Cheshire. Homeowner, Karen Hampton said: "I bought the house a couple of years ago and as soon as I walked in, I completely fell in love with its character and charm. It is hard to tell but it has been a Co-Op and a taxi rank in the past, and because of this the layout is really unique. I enlisted Real Stone & Tile's expertise to help with three bathrooms and the hallway. I love grey tones with a subtle pop of colour and so Leigh and the team suggested some really stunning options such as the Marazzi patterned floor in the en-suite bathroom and mood lighting. I also wanted beautiful statement pieces such as the spectacular Avila Dos 'Sue Lux' basin in the downstairs bathroom and storage unit in the hallway – the quality is incredible! I'm so pleased with the overall finish and thank the team for their hardwork in helping me realise my vision."